Born in Millville, New Jersey, Waldman only lived in New Jersey very briefly. She was raised on MacDougal Street in New York City's Greenwich Village, and received her B.A. from Bennington College in 1966. During the 1960s, Waldman became part of the East Coast poetry scene, in part through her engagement with the poets and artists loosely termed the Second Generation of the New York School. During this time, Waldman also made many connections with earlier generations of poets, including figures such as Allen Ginsberg, who once called Waldman his "spiritual wife." From 1966-1968, she served as Assistant Director of the Poetry Project at St. Mark's; and, from 1968–1978, she served as the Project's Director. In the early 1960s, Waldman became a student of Buddhism. In the 1970s, along with Allen Ginsberg, she began to study with the Tibetan Chogyam Trungpa Rinpoche. While attending the Berkeley Poetry Conference in 1965, Waldman, with poet Lewis Warsh, was inspired to found Angel Hair, a small press that produced a magazine of the same name and a number of smaller books. It was while she was attending this conference that she first committed to poetry after hearing the Outrider poets. In 1974, with Trungpa, Ginsberg, and others, Waldman founded the Jack Kerouac School of Disembodied Poetics at the Naropa Institute in Boulder, Colorado (now Naropa University), where she remains a Distinguished Professor of Poetics and the Director of Naropa's famous Summer Writing Program. In 1976, Waldman and Ginsberg were featured in Bob Dylan's film, Renaldo and Clara. They worked on the film while traveling through New England and Canada with the Rolling Thunder Revue, a concert tour that made impromptu stops, entertaining enthusiastic crowds with poetry and music. Waldman, Ginsberg, and Dylan were joined on these caravans by musicians such as Joan Baez, Joni Mitchell, Eric Anderson, and Joe Cocker. Waldman reveled in the experience, and she often thought of recreating the poetry caravan. Waldman married Reed Bye in 1980, and their son, Edwin Ambrose Bye was born on October 21, 1980. The birth of her son proved to be an "inspiring turning point" for Waldman, and she became interested in and committed to the survival of the planet. Her child, she said, became her teacher. Waldman and Ambrose Bye perform frequently, and the two have created Fast Speaking Music and have produced multiple albums together. Waldman has been a fervent activist for social change. In the 1970s, she was involved with the Rocky Flats nuclear weapons facility ten miles to the south of Boulder, Colorado. With Daniel Ellsberg and Allen Ginsberg, she was arrested for protesting outside of the site. She has been a vocal proponent for feminist, environmental, and human rights causes; an active participant in Poets Against the War; and she has helped organize protests in New York and Washington, D.C. Although her work is sometimes connected to the Beat Generation, Waldman has never been, strictly speaking, a "Beat" poet. Her work, like the work of her contemporaries in the 1970s New York milieu of which she was a vital part—writers like Alice Notley and Bernadette Mayer, to name only two—is more diverse in its influences and ambitions. Waldman is particularly interested in the performance of her poetry: she considers performance a "ritualized event in time," and she expresses the energy of her poetry through exuberant breathing, chanting, singing, and movement. Waldman credits her poem, Fast Speaking Woman, as the seminal work that galvanized her idea of poetry as performance. Ginsberg, Kenneth Koch, Lawrence Ferlinghetti - all encouraged her to continue to perform her poetry. 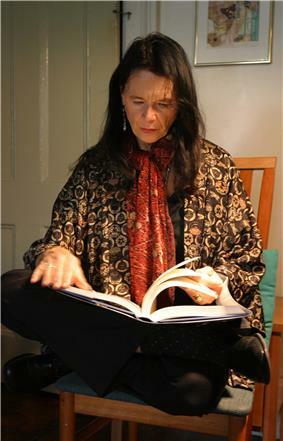 Waldman has published more than forty books of poetry. Her work has been widely anthologized, featuring work in Breaking the Cool (University of Mississippi Press, 2004), All Poets Welcome (University of California Press, Berkeley, CA, 2003), Women of the Beat Generation (Conari Press, Berkeley, CA, 1996), Postmodern American Poetry (W.W. Norton, New York, 1994) and Up Late (Four Walls Eight Windows, New York, 1988) among others. Her poems have been translated into French, Italian, German, Turkish, Spanish, and Chinese. 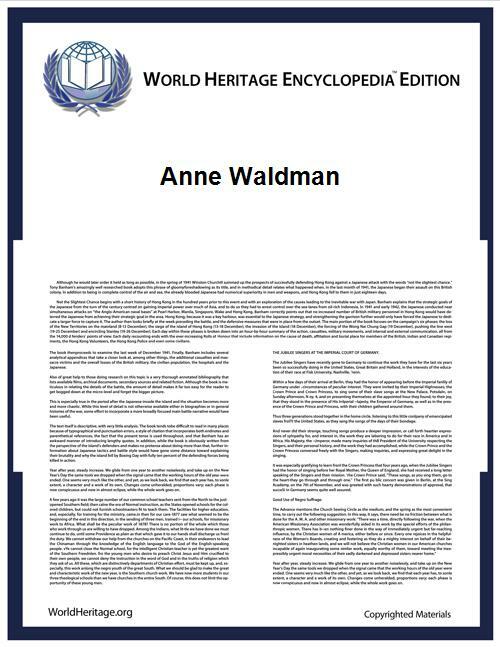 Waldman is also the editor of several volumes relating to modern, postmodern, and contemporary poetry. Over the course of her career, Waldman has also been a tireless collaborator, producing works with artists Pat Steir; musicians Don Cherry and Steve Lacy; dancer Douglas Dunn; filmmaker and husband Ed Bowes; and her son, musician/composer Ambrose Bye. Waldman has been a Fellow at the Emily Harvey Foundation (Winter 2008) and the Bellagio Center in Italy (Spring 2006). She has also held residencies at the Christian Woman’s University of Tokyo (Fall 2004); the Schule für Dichtung in Vienna (where she has also served as Curriculum Director in 1989); the Institute of American Indian Arts in Santa Fe, New Mexico; and the Stevens Institute of Technology in Hoboken, New Jersey (1984). She has served as an advisor to the Prazska Skola Projekt in Prague, the Study Abroad on the Bowery (since 2004), and has been a faculty member in the New England College Low Residency MFA Program (since 2003). She is the recipient of grants from the National Endowment for the Arts (NEA) and the Contemporary Artists Foundation, and the Poetry Foundation. With writer and scholar Ammiel Alcalay, she founded the Poetry is News Coalition in 2002. Waldman also won the International Poetry Championship Bout in Taos, New Mexico twice. More recently, in 2002 she co-founded the Poetry Is News collective with writer/scholar Ammiel Alcalay. In 2011, Waldman was elected a Chancellor of the Academy of American Poets. Her archive of historical, literary, art, tape, and extensive correspondence materials (including many prominent literary correspondents, such as: William S. Burroughs, Robert Creeley, Diane Di Prima, Lawrence Ferlinghetti, Allen Ginsberg, and Ken Kesey) resides at the University of Michigan's Special Collections Library in Ann Arbor, Michigan. A 55-minute film titled “Anne Waldman: Makeup on Empty Space,” a film by poet Jim Cohn, documents the opening of the Anne Waldman Collection at the University of Michigan. Structure of the World Compared to a Bubble, Penguin Poets, 2004. In the Room of Never Grieve: New & Selected Poems 1985–2003, Coffee House Press, 2003. Dark Arcana / Afterimage or Glow, Heaven Bone Press, 2003. War Crime, Elik Press, 2002. Vow to Poetry: Essays, Interviews, & Manifestos, Coffee House Press, 2001. Marriage: A Sentence, Penguin Poets, 2000. Iovis II, Coffee House Press, 1997. Fast Speaking Woman, 20th Anniversary Edition, City Lights Books, 1996. Kill or Cure, Penguin Poets, 1996.
lovis: All Is Full of Jove, Coffee House Press, 1993. Troubairitz, Fifth Planet Press, 1993. Fait Accompli, Last Generation Press, 1992. Not a Male Pseudonym, Tender Buttons Books, 1990. Helping the Dreamer: New and Selected Poems: 1966-1988, Coffee House Press, 1989. Tell Me About It, Bloody Twin Press, 1989. The Romance Thing, Bamberger Books, 1987. Blue Mosque, United Artists, 1987. Skin Meat Bones, Coffee House Press, 1985. Makeup on Empty Space, Toothpaste Press, 1984. First Baby Poems, Rocky Ledge, 1982, augmented edition, Hyacinth Girls, 1983. To a Young Poet, White Raven, 1979. Shaman / Shamane, White Raven, 1977. Journals and Dreams, Stonehill, 1976. Fast Speaking Woman and Other Chants, City Lights, 1975 (revised edition, 1978). Sun the Blonde Out, Arif, 1975. Fast Speaking Woman, Red Hanrahan Press, 1974. The Contemplative Life, Alternative Press, c. 1974. Life Notes: Selected Poems, Bobbs-Merrill, 1973. The West Indies Poems, Adventures in Poetry, 1972. Spin Off, Big Sky, 1972. Light and Shadow, Privately printed, 1972. Holy City, privately printed, 1971. No Hassles, Kulchur Foundation, 1971. Icy Rose, Angel Hair, 1971. Giant Night: Selected Poems, Corinth Books, 1970. Up Through the Years, Angel Hair, 1970. O My Life!, Angel Hair, 1969. On the Wing, Boke, 1968. Fleuve Flâneur (with Mary Kite), Erudite Fangs, 2004. Zombie Dawn (with Tom Clark), Skanky Possum Press, 2003. Polemics (with Anselm Hollo & Jack Collom), Autonomedia. Young Manhattan (with Bill Berkson). Ai Lit / Holy (with Eleni Sikelianos & Laird Hunt), 2001. Polar Ode (With Eileen Myles), Dead Duke, 1979. Four Travels (With Reed Bye), Sayonara, 1979. Sphinxeries (With Denyse duRoi), 1979. Self Portrait (With Joe Brainard), Siamese Banana Press, 1973. Memorial Day (With Ted Berrigan), Poetry Project, 1971. The Eye of The Falcon (music by Ambrose Bye) 2006. By the Side of the Road (with Ishtar Kramer), 2003. Battery: Live from Naropa, 2003. Alchemical Elegy: Selected Songs and Writings, Fast Speaking Music, 2001. Women of The Beat Generation, Audio-Literature, 1996. Live in Amsterdam, Soyo Productions, 1992. Made Up in Texas, Paris Records (Dallas), 1986. Crack in the World, Sounds True (Boulder),1986. Uh-Oh Plutonium!, Hyacinth Girls Music (NYC), 1982. Fast Speaking Woman, "S" Press Tapes (Munich), n.d.
John Giorno and Anne Waldman, Giorno Poetry Systems Records, 1977. Beauty and the Beast (With Allen Ginsberg), Naropa Institute, 1976. Other recordings on Giorno Poetry Systems compilations: the Nova Convention (1979), Big Ego (1978), Disconnected (1974), The Dial-a-Poem Poets (1972). Colors In the Mechanism of Concealment, with Ed Bowes, 2004. The Menage (for Carl Rakosi), with Ed Bowes, 2003. Live at Naropa, Phoebus Productions, 1990. Battle of the Bards, (Lannan Foundation), Metropolitan Pictures, Los Angeles, 1990. Eyes in All Heads, Phoebus Productions, 1989. Poetry in Motion, directed by Ron Mann, Sphinx Productions (Toronto). Also performed in Bob Dylan's film Renaldo and Clara (1978), with a recording of the poem Fast Speaking Woman included on the sound track. Beats at Naropa (with Laura Wright), Coffee House Press, 2010. Civil Disobediences: Poetics and Politics in Action (with Lisa Birman), Coffee House Press, 2004. The Angel Hair Anthology: Angel Hair Sleeps With A Boy In My Head (with Lewis Warsh), Granary Books, 2001. The Beat Book, Shambhala Publications, Boston, 1996. Disembodied Poetics: Annals of the Jack Kerouac School, University of New Mexico Press, 1993. Out of This World: An Anthology from The Poetry Project at the St. Mark's Church In-the-Bowery 1966-1991, Crown Publishing Group, 1991. Nice to See You: Homage to Ted Berrigan, Coffee House Press, 1991. Talking Poetics: Annals of the Jack Kerouac School of Disembodied Poetics (with Marilyn Webb), Shambhala, vols. 1 and 2, 1978. The World Anthology: Poems from the St. Mark's Poetry Project, Bobbs-Merrill, 1969. Fellow, The Emily Harvey Foundation, Venice, winter 2007. Atlantic Center for the Arts Residency, 2002. Civitella Ranieri Center Fellow, 2001. Foundation for Contemporary Arts Grant Recipient, 2001. Vermont Studio School Residency, 2001. The Poetry Society of America’s Shelley Memorial Award, 1996. National Endowment for the Arts Grant, 1979-80. The National Literary Anthology Award, 1970. The Poets Foundation Award, 1969. The Dylan Thomas Memorial Award, 1967.